A prominent need was filled at Tenwek Dental Clinic this past month thanks to many of your generous donations. People had prayed for many years for an OPG x-ray machine. God has provided. After being in contact with the Massachusetts Dental Society Dr. Kuyaya found that an Orthopantomograph OP-100 was available for donation by Dr. Miller. What is a panoramic x-ray? You may have had this x-ray taken before you had your 3rd molars removed. 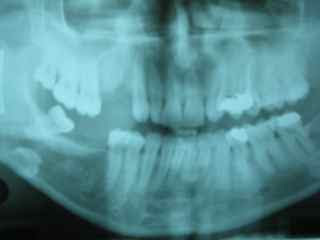 An OPG or panoramic x-ray (see picture) gives us exactly that; a panoramic snapshot of the the entire oral region. It is crucial x-ray for diagnosing jaw fractures, finding oral hard tissue malignancies, and locating 3rd molars. Our treatment at Tenwek is probably upwards of 50% oral surgical procedures. An OPG is standard in an OMFS office. 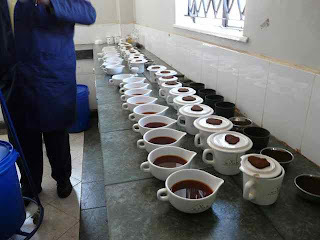 Tenwek Hospital and this region of Kenya has never had such a machine. They are costly (20,000 USD). Dr. Miller graciously donated this machine free of charge, with one catch--shipping! As you can see shipping a machine about the size of a telephone booth is not an easy endeavor. After discussions with Northwest Airlines, World Gospel Mission, Samaritan's Purse, Dr. Miller, and volunteers with the Massachusetts Dental Society we discovered that the machine could be dismantled, crated, and air-freighted for 1100 USD. It was fantastic. 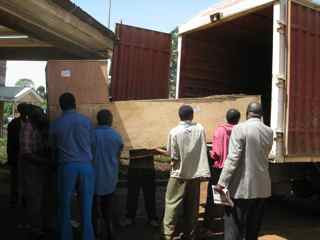 With the help of WGM it cleared customs at Kenyatta National Airport with no further charges as it was marked as a donated item for a Christian Mission Hospital. The machine as the picture shows arrived by Lori in great condition and careful lifting. It was soon mounted, installed, electrically converted to Kenyan voltage, and is now in use. We are using this machine 20 times over per week. We feel like we are no longer working in the dark. We also hope it will allow Tenwek Dental to become even more of a referral center. Definition of a hobbit: gentle, peace-loving, two-to-four feet tall, roundish, jovial face, shortish in the leg, small feet, like to eat two breakfasts. Let me share with you Erick's story. I find Erick to be talented, and hard-working. We are praying to find a way for Erick to be able to attend Dental School. "My name is Erick Langat. I was born in 1979 in the village of Koijat just 80 km from Tenwek Hospital in Southwestern Kenya. I am of the Kispsigis Tribe. I was raised to speak English, Swahilli, and KiKipsigis. In 1997 I finished secondary school in Kakibei. Even then I was uncertain about my future, but applied to Kenya Medical Training College in Nairobi. Despite only three open positions for KMTC per district by God’s grace I was accepted. 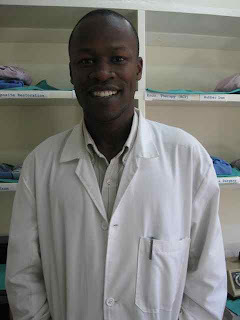 In 2003 I finished my studies at KMTC and graduated as an Oral Health Officer. An Oral Health Officer is trained to treat the basic needs of the Kenyan People. I am competent providing patient care with dental extractions, scaling of teeth, dental exams, and community dental education. After completion of my training I entered internship. 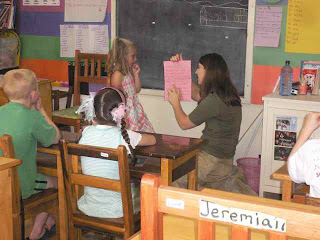 In 2006 I was offered a full time position to work at Tenwek Mission Hospital. I took on the responsibilities of Tenwek Dental Clinic as Dr. Kuyaya the full time Dentist was to leave for South Africa for two years for masters training in restorative dentistry. I have been content working at Tenwek ever since. I am happy here as my duties include organizing dental community outreach, tooth extractions, full mouth scaling, dental exams, taking x-rays, and keeping statistics. Despite my happiness I feel like God has even more left for me to learn. I want to expand my training to include fillings, biopsy, crowns, and root canals. I have a heart for my Kipsigis’ people and felt directed to attend dental school to better serve them. Following God’s calling in 2007 I applied and was accepted to Moi University School of Dentistry (one of only two dental schools in Kenya). I was unable to afford tuition. Tuition at Moi University is about 450,000 KSH annually (5,800 USD). My total annual salary would cover less than half that amount. Student loans are not available for me here in Kenya. I sought out funding through Tenwek Hospital with the understanding that for each year of dental school I am supported I am bonded to the hospital for 2 years. The funding was not available so I was forced to defer my enrollment. In 2008 I again sought help from Tenwek Hospital for tuition assistance unsuccessfully. I was encouraged to apply to a more affordable dental school. I have currently applied to Makerere University School of Dentistry in Kampala, Uganda. The tuition is 200,000 KSH annually (2,500 USD). I will be notified of my acceptance in August. If I am able to secure funding for entrance into dental school I see myself returning to Tenwek Mission Hospital to serve the Kipsigis people. I am a Christian and was baptized in 2005. God has changed my life. Before Christ I felt like just a human being, a person of the flesh. Now I feel I am living the Christian Life. While seeing patients I am lifted up by God’s love. In our busy dental clinic with patients with complicated dental fractures and infections it is easy to be overwhelmed. Jesus to me is about help. When I am burdened I look to Paul’s words in Romans Chapter 8:31-32. Kimwal nel anyun eng’ tuguchuto? Ngo mi Jehovah Komostanyom, Ko ng’one Kinndaech? Inendet ne ki ma nire Weririyi ago Kigon inendet agobo achek tugul, tos magonech tuguk tugul eng’ aiybindo koboto inendet. 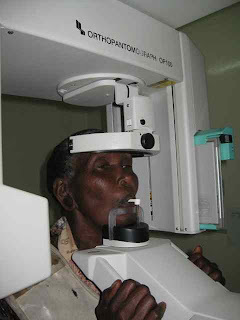 My faith has called me and inspired me to help the poor at Tenwek Hospital in Kenya. "Doctorie, " Erick our Oral Health Officer said as I was in the process of completing a root canal. "They have a patient they want you to see in Casualty. He was attacked by a buffalo." Erick completed the sentence casually just like, Doctor Friess the patient for the filling cancelled. "OK, I think I'll take a break here and go see this patient." I walked to Casualty (ER) to find Mamusi Saii and his father dressed in their traditional red Massai blankets. Mamusi is 16 years old. His story was that a Cape Buffalo (perhaps the most dangerous animal on the Mara) charged him and picked him up in the air. During the course of this Mamusi's spear gouged his cheek. He suffered multiple lacerations to his face, swollen eyelids,and a fractured jaw. Dad and I saw the patient together. His eye was responsive to light and intact. His mandible was fractured at the angle. Erick and I spent the morning wiring his teeth together to stabilize the mandible to allow healing. Mamusi was extremely courageous. The entire procedure was done under local anesthetic. He seems to be healing well just 3 days after the attack and plan to send him back to the Mara today. I hope he stays far away from any further encouters with a Cape Buffalo. 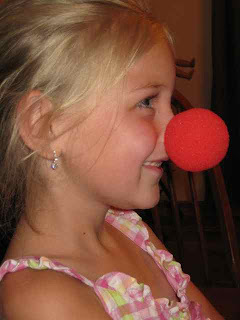 One thing you never want to hear your child say, "Mom, Meredith has a ponga. Mom, Meredith has a ponga! Come!" The landscapers had left a ponga (machete) out and Meredith was running around with it as Amelia chased her and tried to get it out of her hands. Thankfully no one was injured. Meredith was carrying the ponga by its blade and swinging it around. We'll have to remind the landscapers to put these away and out of reach of a 2 year old (or any child for that matter)! 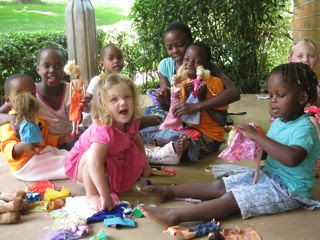 When Amelia invited most of the Kenyans in our neighborhood over to play Barbies I was a little curious what they would do. So when I went to check on them and I heard Amelia say, "Alright, Pastor Ken is ready to preach," I was reassured. Indeed the girls made a congregation, church building, pews, and pastor (although I thought it would have been great if the pastor was female). Not to mention they spent hours getting the barbies all decked out for the church service. Terminating a viable pregnancy is illegal in Kenya. Consequently women go to extreme methods to terminate "unwanted" pregnancies. We had three patients admitted this week for this reason. The first patient was in septic shock, the second patient in renal failure and the third patient in acute respiratory distress. Each woman, eventually shared why she did what she did and the intense remorse each felt. 2 of these women are still in critical condition, and the most critical care I can give is assuring them of God's love, forgiveness and desire to enter into relationship with them. 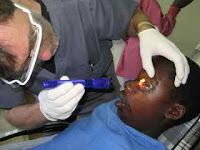 Preventative Dental Care such as teeth cleaning and check-ups are a foreign concept in Kenya. Typically the only time a Kenyan patient comes to our clinic is when there is a major problem; swelling, pain, bad odor, bleeding gums, or a gigantic portion of their tooth missing,. 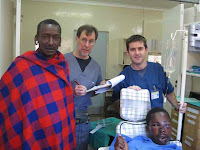 It was a pleasant surprise to meet Jonathan, a Massai who took interest in caring for his teeth. 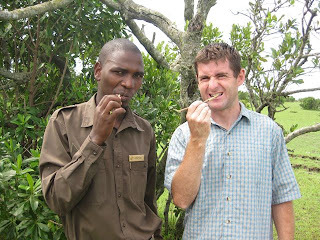 After I told Jonathan I was a Doctoriae Wa Meno-- (Dentist), we visited the Pepper Plant. He broke off a branch and we stripped the bark from the limb. "This is a Massai toothbrush. Scrub your teeth and you will taste the pepper." I'll admit the Pepper Plant toothbrush had a winter-fresh flavor similar to Colgate. Jonathan worked his toothbrush for the next 30 minutes. We've had a good visit with Nana, Papa, and Auntie Ana. We've able to tour a tea factory, see some animals, visit an orphanage and take some hikes. My parents brought many donated dental supplies which Malin has been busy organizing. 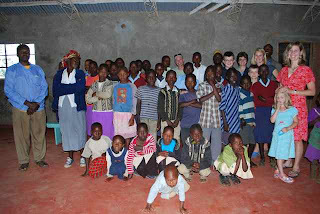 They also received some money which we used to buy groceries for an orphanage. Stuffed along side the dental equipment were baby hats made by Westminster Presbyterian Church, our church in Akron. Yesterday we enjoyed picking out hats with the mothers in the NICU for their babies. Its a privilege to share in these tangible expressions of God's love. Have you not been paying attention? Have you not been listening? Haven't you heard these stories all your life? Don't you understand the foundation of all things? God sits high above the round ball of earth. The people look like mere ants. He stretches out the skies like a canvas— yes, like a tent canvas to live under. He ignores what all the princes say and do. The rulers of the earth count for nothing. Princes and rulers don't amount to much. Like seeds barely rooted, just sprouted, They shrivel when God blows on them. Like flecks of chaff, they're gone with the wind. 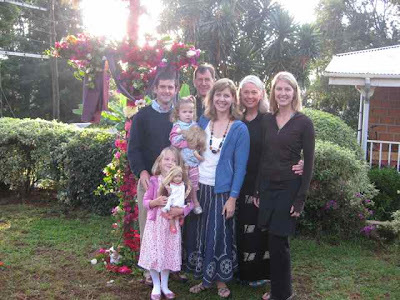 Mom, Dad & Ana were welcomed to Kenya by a 6AM sunrise Easter service service. After a time of prayer, scripture and reflection we placed flowers on the cross. It was truly beautiful to see the sun rise over this cross and rejoice because Jesus is alive. We also gave thanks because the rainy season has started. Drought is affecting most of Kenya, but our area is receiving rain vital for crops, animals and people. This rain also replenishes the river and waterfall that provide our hydroelectric power. The girls are holding dolls Nana brought for them. Amelia diligently changes her doll based on the weather and time of day. Meredith also carries her doll around and reminds Amelia, "No, sister this is mine." 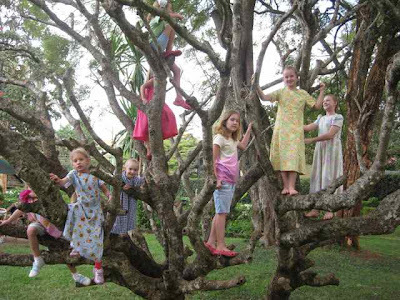 A Tree that grows Missionary Kids? 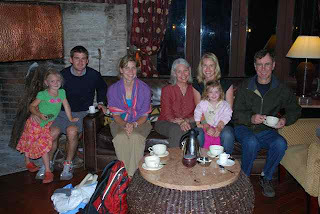 Amelia (hidden behind the branch) always enjoys a trip to the guest houses in Nairobi despite the 4 hour drive. The new friends she finds are always worth the travel. Thanks for all who prayed for a safe arrival for Mom, Dad and Ana. 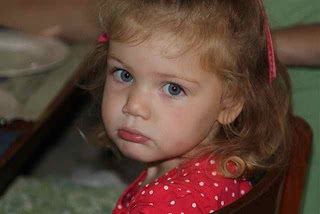 Also, for those of you that prayed for Meredith, we give thanks she is better. In fact, she's "trying" to put back on the 5 pounds she lost quickly. This a.m. she ate 3 breakfasts starting with cereal, then trying eggs and concluding with yogurt and granola! We're going to a village market today to get some groceries and fabric. I'm also hoping to arrange a trip to an orphanage and tea factory. But overall the best part about having family around is just being together. 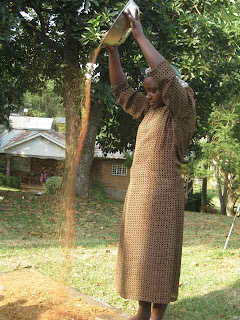 There is an unfortunate "profession" that has developed in the rural of areas of Kenya. These "professionals" call themselves exodontists. They are men who are unlicensed and without training who extract teeth with dirty pliers, in dirt floor shacks, often without any anesthesia. This is Chepkorono. Chepkorono surprisingly, had already had her tooth removed. She visited us one week after seeing an exodontist not to far from Tenwek. As you can see she has not healed appropriately. 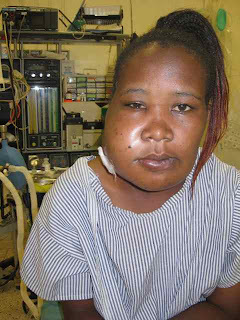 It is likely that she has developed a massive submandibular cellulitis due to the use of dirty/contaminated instruments. Sadly all in attempt to save a couple Shillings. By the time we saw her Chepkorono was quite sick with fever, fatigue, and naturally lots of pain. Eventually this type of swelling can be life threatening if it begins to impinge on the trachea. Chepkorono was taken to Theatre and a small incision was made below her mandible to drain out (burst out) cc's of foul smelling straw colored fluid. This was repeated again the next day. She has made a full recovery..and has promised to visit Tenwek for any further dental care. Meredith has still been vomiting the past 2 weeks. Although she's keeping some food/liquids down it's been stressful seeing her sick, waking up at night to care for her in between being called to the hospital and hoping that we are treating the right thing (giardia). She's laying on the couch right now, quietly sucking her thumb. Meredith is usually moving all over, even in her sleep. Call has also been particularly challenging. Not just the volume of on-night call, but the complexity. Last night a patient in her third trimester came in with pulse of 200, respiratory rate of 60 and sat of 70%. She was in thyroid storm and I wasn't sure that I could stabilize her with the limited medication supplies we have. Thankfully she lived through the night. 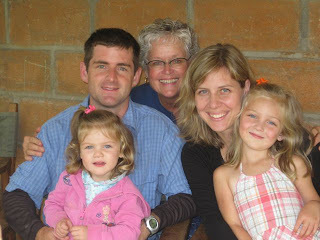 So I'm grateful that the next 10 days I have off to spend time with my parents and sister who arrive Friday. Time to take more care of Meredith. Time to read and research more about certain obstetrical issues. And time to prepare for the Easter service this Sunday where we are reminded that Christ loves us. Grammie left Monday and after a 4 hour drive to Nairobi, 10 hour wait until her flight, 8.5 hour flight to Amsterdam, 4 hour layover in Amsterdam, 10 hour flight to Seattle, 6 hour layover, and then a 1.5 hour flight to Bend, Oregon, she made it safely home and slept. It's not easy to get here, but we promise it's worth the trip! 1) My favorite color is pink. 3) My favorite activity is climbing trees. 4) When I grow up I want to be a veterinarian, gem scientist, and "Planet Earth" movie maker. 5) My favorite flower is the rose. 6) My favorite holiday is Christmas. 7) My favorite pet is my fish Buluga. We left him in Ohio. 8) My birthday is July 26, 2003. 9) She has a new nickname from the boys. The call Amelia Sparkly Eyes.